In the past decade Seth Mnookin has become a chronicler of some of the icons of American popular culture. He wrote a popular book, “Feeding the Monster,’’ on the ascent of the Red Sox, and a controversial book, “Hard News,’’ on the scandals of The New York Times. Now he is taking on another modern phenomenon, the movement against vaccinations. “The Panic Virus’’ is sure to attract attention — and the virulent criticism of one of contemporary life’s most ardent insurgencies, those who believe inoculations possess the power to injure. Specifically the book focuses on the scare triggered by a flawed 1998 scientific paper suggesting that the measles-mumps-rubella vaccine could cause autism. The paper, by Andrew Wakefield, has since been discredited, most recently in a report Thursday saying that Wakefield had altered facts in his study. In his book, Mnookin traces the spread of the panic and the role of the media in it. 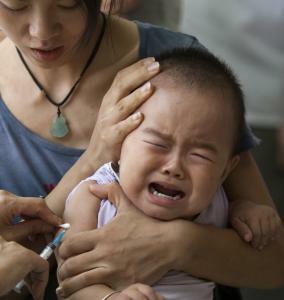 Mnookin’s book is an unsparing brief against the vaccine skeptics. But in a larger sense, this volume is less about the insurrection against inoculations than it is about the democratization of information. It is less about the movement to battle the medical establishment than it is about the ability of social networks to mobilize for what Mnookin and most mainstream scientists and doctors believe is a bad cause. It is less about reasoned debate than about the free flow of information through the Internet. It is less about the contagion of ideas than about the contagion of misinformation and mistrust that metastasizes in the new technology. And in some ways it is less about the modern autism wars than about cultural resistance to vaccines over the centuries, for in setting forth his argument he provides a history of disease and vaccines that is one of the high points of this volume. We’ve come a long way from the early methods used to combat smallpox, which in 1717 included spreading pus from an infected person onto the open wound of an uninfected person. But these asides involving medical history are more than a curiosity. They underline the power of humans’ distrust of inoculation, the roots of which Mnookin sees in the American Colonists’ “hair-trigger resistance to anything that was perceived as infringing upon individual liberties.’’ Resistance to inoculation is as American as resistance to oppression — often the rationale summoned in these battles, which combine science and ideology in a toxic brew. In time, freedom from disease has become an important American freedom. But skepticism of the American medical establishment became (and remains) an important part of the civic landscape, often inflamed, Mnookin contends, by shoddy shock-seeking journalism. This is Mnookin’s argument: The evidence for the conviction that vaccines are dangerous is sketchy — a medical problem. The paroxysms and panics were appealing to document — a journalistic problem. Journalists — not all, but enough — are drawn to the dramatic, to the romance of lone-wolf skeptics tilting against well-established assumptions taught in well-established institutions by well-established practitioners. Plus this: Science has not exactly been infallible. These code words speak volumes — Bhopal. The Challenger. Love Canal. Three Mile Island. Another result is the decline in vaccinations in many communities, especially those with a liberal orientation and high incomes. Ashland, Ore., has a vaccine exemption rate of about 30 percent. The rate of people not vaccinated in California’s Marin County, one of the wealthiest in the nation, is three times greater than that of the rest of the state.